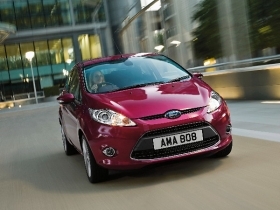 With 32,500 units sold in Feb., the Fiesta was Europe's top-selling small car. Ford Motor Co. said its new-car sales across its main 19 European markets rose by 1.8 percent to 93,200 in February, compared with the same month last year, despite heavy discounting by rivals. With western European new-car sales forecast to fall by between 1 million and 1.5 million units in 2010 as scrappage schemes end, industry observers expect heavy discounting by volume manufacturers. Ingvar Sviggum, Ford of Europe's sales and marketing chief, said Ford will not take part in any price wars. "We understand the need to be competitive in the market, but we will not engage in actions that jeopardize the sustainability of our business or that devalue our brand. Such strategies are self-defeating in the longer term," Sviggum said in a statement. He added that Ford's market share "was pretty stable in February despite aggressive discounting by some of our competitors." Sviggum did not name competitors who are offering big discounts on their new cars. Ford's rivals in Euriope include Opel, Volkswagen, Renault, Fiat and PSA/Peugeot-Citroen. Ford's sales gain in February is the ninth consecutive monthly increase in Europe. Scrappage incentives in major markets such as Germany, France, Italy and Spain, have boosted sales of Ford's Ka and Fiesta models as buyers used government payouts for scrapping old cars to purchase small and inexpensive new models. Ford said Fiesta monthly sales at 32,500 were the highest in February since 1998, maintaining the Fiesta in its position as Europe's No.1 small car and No.2 best-selling car overall in February. Italy led Ford's European sales charts for February, with sales increasing by 3,800 units to 22,000. In Spain, Ford's February volume increased by 53 percent to 8,800 units, while in France sales grew by more than 17 percent to 12,200. Ford was the No.1 best-selling brand in the UK, Hungary and Turkey. Across its 51 markets including Russia and eastern Europe, Ford of Europe's sales were down 3.3 percent to 105,300 in February.